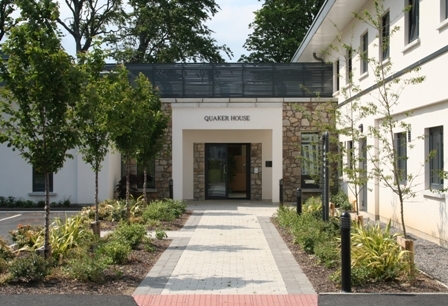 Quaker House Dublin is located in the beautifully landscaped grounds of Bloomfield Health Services. Situated not far from the M50, serviced by the 15B bus route (Time table, Dublin Bus website), with parking facilities, Quaker House is an ideal venue for your needs. Our rooms have been used for:- Conferences – Religious Meetings – AGM’s – Workshops – Pilates – Yoga – Fitness – Functions – Community Groups. With WiFi access and Conference Call facilities, virtual meetings are possible at Quaker House. Kitchen professionally equipped, suitable for your catering needs. All our facilities are available on a one off/short term basis or as a regular letting. A copy of our terms and conditions are available on request. Discounted rates are available for long term lettings. Most Quaker Meeting Houses have rooms available to hire. For queries regarding room hire at any premises apart from Quaker House, Stocking Lane, please contact the relevant Meeting House directly.